I wish you a sunny Sunday morning! Today I write again about my favorite guitar players. One of the first guitar solos I trried to play on my electric guitar was Jimmy Page´s solo in “Stairway To Heaven”. “Stairway to Heaven” is a song by the English rock band Led Zeppelin, released in late 1971. It was composed by guitarist Jimmy Page and vocalist Robert Plant for the band’s untitled fourth studio album (often called Led Zeppelin IV). It is often referred to as one of the greatest rock songs of all time. “Stairway to Heaven” was voted number three in 2000 by VH1 on its list of the 100 Greatest Rock Songs, and was placed at number 31 on “Rolling Stone’s 500 Greatest Songs of All Time“. It was the most requested song on FM radio stations in the United States in the 1970s, despite never having been commercially released as a single there. 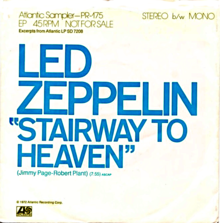 In November 2007, through download sales promoting Led Zeppelin’s Mothership release, “Stairway to Heaven” hit number 37 on the UK Singles Chart. Here´s a fantastic live version from the “Led Zapellin” cult film “The Song Remains The Same”. 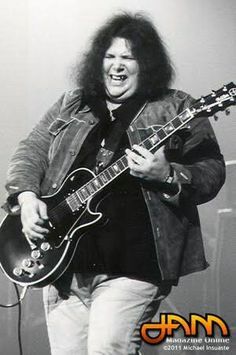 Anothe guitar player who influenced me very much was the thick virtuoso Leslie West who really could “speak and sing” with his guitar in an unmistakable way.He was the first guitarist to turn his guitar over in overtones, a style later adopted by almost all guitarists. Leslie West (born Leslie Weinstein; October 22, 1945) is an American rock guitarist, vocalist, and songwriter. He is best known as a founding member of the hard rock band Mountain. West was born in New York City, to a Jewish family. He grew up in Hackensack, New Jersey, and in East Meadow, New York, Forest Hills, New York and Lawrence, New York. After his parents divorced, he changed his surname to West. His musical career began with The Vagrants, an R&B/Blue-eyed soul-rock band influenced by the likes of The Rascals that was one of the few teenage garage rock acts to come out of the New York metropolitan area itself (as opposed to the Bohemian Greenwich Village scene of artists, poets and affiliates of the Beat Generation, which produced bands like The Fugs and The Velvet Underground). The Vagrants had two minor hits in the Eastern US: 1966’s “I Can’t Make a Friend” and a cover of Otis Redding‘s “Respect” the following year. Some of the Vagrants’ recordings were produced by Felix Pappalardi, who was also working with Cream on their album Disraeli Gears. In 1969, West and Pappalardi formed the pioneering hard rock act Mountain, which was also the title of West’s debut solo album. Rolling Stone identified the band as a “louder version of Cream” With Steve Knight on keyboards and original drummer N. D. Smart, the band appeared on the second day of the Woodstock Festival on Saturday, August 16, 1969 starting an 11-song set at 9 pm. Here´s Leslie West & Mountain Live with “Nentucked Sleighride. In my list of exceptional guitarists Eric Clapton can´t be missed. 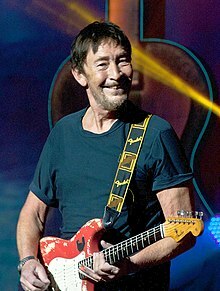 Eric Patrick Clapton, CBE (born 30 March 1945), is an English rock and blues guitarist, singer, and songwriter. He is the only three-time inductee to the Rock and Roll Hall of Fame: once as a solo artist and separately as a member of the Yardbirds and of Cream. Clapton has been referred to as one of the most important and influential guitarists of all time. Clapton ranked second in Rolling Stone magazine’s list of the “100 Greatest Guitarists of All Time” and fourth in Gibson’s “Top 50 Guitarists of All Time”. He was also named number five in Time magazine’s list of “The 10 Best Electric Guitar Players” in 2009. In the mid-1960s Clapton left the Yardbirds to play with John Mayall & the Bluesbreakers. Immediately after leaving Mayall, Clapton formed the power trio Cream with drummer Ginger Baker and bassist Jack Bruce, in which Clapton played sustained blues improvisations and “arty, blues-based psychedelic pop”. After Cream broke up, he formed blues rock band Blind Faith with Baker, Steve Winwood, and Ric Grech. Clapton’s solo career began in the 1970s, where his work bore the influence of the mellow style of J. J. Cale and the reggae of Bob Marley. His version of Marley’s “I Shot the Sheriff” helped reggae reach a mass market. Two of his most popular recordings were “Layla“, recorded with Derek and the Dominos; and Robert Johnson‘s “Crossroads“, recorded with Cream. Following the death of his son Conor in 1991, Clapton’s grief was expressed in the song “Tears in Heaven“, which was featured on his Unplugged album. Here´s “Cream” with the original version of “White Room” ft. Clapton playing a fantastic solo with a Wha Wha Pedal. From another incredible guitarist I tried to copy his exceptional style to play slde guitar with a “Bottleneck”. In America he is best known for the 1978 hit song “Fool (If You Think It’s Over)” that reached No. 12 on the Billboard Hot 100 and spent three weeks at No. 1 on the Adult Contemporary chart. This success earned him a Grammy nomination as Best New Artist in 1979. His other hit songs include, “I Can Hear Your Heartbeat”, “Stainsby Girls”, “Josephine“, “On the Beach” (Adult Contemporary No. 9), “Let’s Dance“, “Driving Home for Christmas“, “Working on It” (Mainstream Rock No. 1), “Tell Me There’s a Heaven”, “Auberge”, “Looking for the Summer”, “Winter Song”, “Nothing To Fear”, “Julia”, and “If You Were Me“, a duet with Elton John. Another guitarist who influenced me a lot is Mike Olfield who first integrated various styles including electronic music into his playing and developed like this an unmistakable sound. Michael Gordon Oldfield (born 15 May 1953) is an English musician and composer. His work blends progressive rock with world, folk, classical, electronic, ambient, and new-age music. His biggest commercial success is the 1973 album Tubular Bells – which launched Virgin Records and became a hit in America after its opening was used as the theme for the film The Exorcist. He recorded the 1983 hit single “Moonlight Shadow” and a rendition of the Christmas piece “In Dulci Jubilo“. One of his geatest hits was “Shadows On The Wall” ft. rockj legend Roger Chapman, the former front man of the legendary “Family”. And here´s Mile Oldfield with one of my favorite songs “Man In The Rain” ft. the charismatic vocal artist Pepsi De Macque. He plays a midi guitar remoting synthesizer sounds. 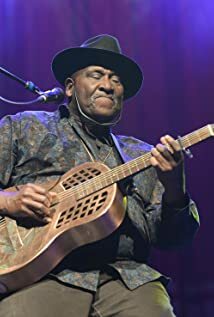 At the end of my story of today I want to make a short trip tp the USA where blues legend Taj Mahal plays a fantastic “Dobro” guitar. I wish you a happy Sunday and hope 2 c u tomorrow.